Keep your FURRY FRIENDS safe in the Summer's Heat!! You can follow this link to "like us" on facebook. 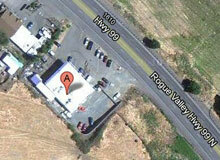 To redeem your free car wash simply stop by our location at 1383 Hwy. 99 North in Ashland, tell any of our staff that you liked us on facebook, they'll check online real quick, and get your car washed for you at absolutely no charge. If you need any repairs, have little dents or dings, we would be happy to do a quick estimate on the damage while you are waiting. Thanks for "liking us", we like you too! You heard it right- we are giving away the new iPAD!! Get all of the details here. 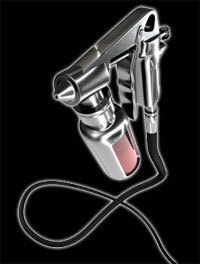 You have until September 30, 2012 to complete your reviews and be entered into the raffle. The lucky winner of the new iPAD will be announced on October 5, 2012. Good luck!! There is a story about Anderson Auto Body, and more speicifically, about owner, Dave Anderson in the July edition of Locals Guide. You can see it online at http://ashland.oregon.localsguide.com/ashlands-premier-body-shop-anderson-auto-body-paint. Another fun commercial from our friend Ross Williams of XRATS Productions. Check out our new commercial, directed by Ross Williams of XRATS Productions. 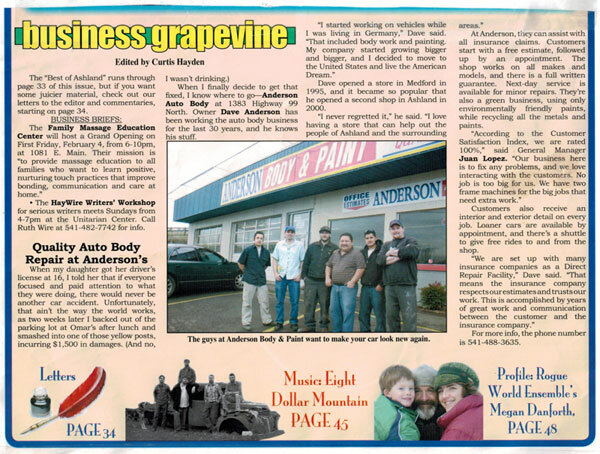 Anderson Auto Body & Paint was happy to be featured in the "Business Grapevine" of Ashland's own Sneak Preview. Click on the image for a larger version. Our current advertisement from Ashland's Sneak Preview community newspaper. 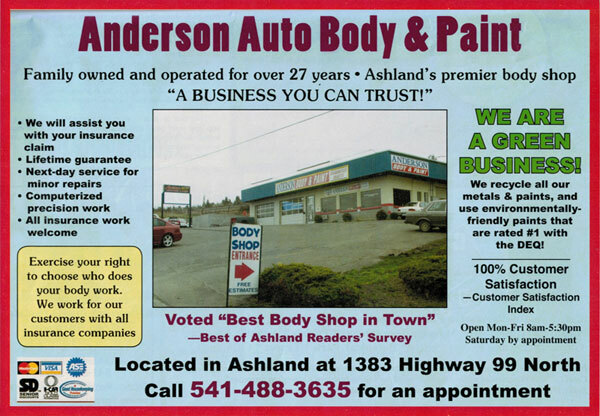 Family owned and operated for over 27 years and voted "Best Body Shop in Town" in the latest Best of Ashland Reader's Survey.